Are Little Cars Really Safe? If you are considering a minicar as your next automobile purchase, you may want to think again. While smaller cars are becoming popular, they do not stand up to overall crash testing nearly as well as larger vehicles. The Insurance Institute for Highway Safety’s small overlap front crash test found that only 1 minicar out of 11 that were tested achieved an acceptable rating. The rest—FAILED. 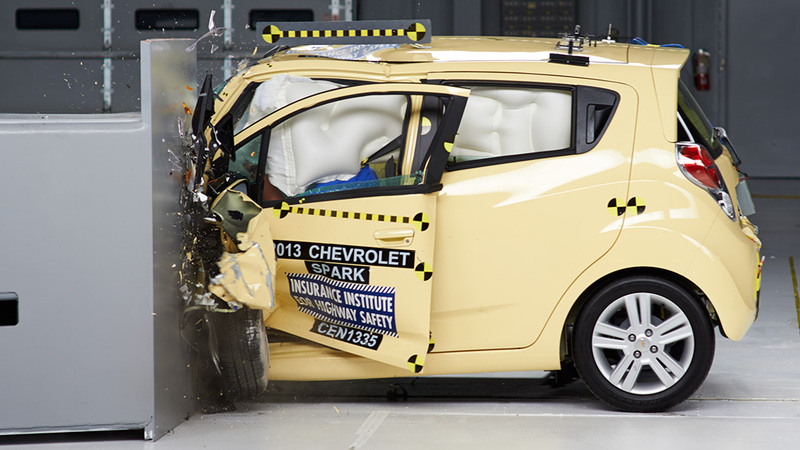 Among those tested, only the Chevrolet Spark received an acceptable rating and good ratings in the Institute’s four other crashworthiness evaluations. This was enough to earn the Spark the 2014 Top Safety Pick award. No other minicar passed the test. According to the Insurance Institute for Highway Safety, “The small overlap front crash test replicates that happens when the front corner of a vehicle collides with another vehicle or object, such as a tree or utility pole”. When they perform the test, 25% of the minicar’s front end on the driver’s side must strike a rigid barrier—at 40 mph. This effectively bypasses the front-end crush zone and makes this test more difficult than other head-on crash tests. While car manufacturers have found a way to improve vehicle structures on larger automobiles to achieve safety in these tests, minicars are at a disadvantage. Small cars are also at a disadvantage, but as a group, they performed better than minicars. 10 out of 17 small cars tested were able to achieve at least acceptable ratings. When an automobile doesn’t perform well on the overlap front crash test, it means that vehicle structure is compromised. This can knock airbags out of place and collapse the driver compartment drastically causing serious and fatal injuries. Of all the minicars evaluated, the Honda Fit and the Fiat 500 fared the worst with serious issues. The Fiat 500 even had its driver door torn off at the hinges. The crash test dummy also hit his head on the instrument panel because the airbag was compromised. He also sustained serious leg injuries as the steering components were pushed back into the dummy model. If a negligent driver injures you or someone you love, an experienced Seattle car crash attorney at Phillips Law Firm can help. If you are interested in learning more about your legal options, call us at 1-800-708-6000. Our Seattle personal injury lawsuit attorneys are waiting to assist you 24/7, offering a free case evaluation. Remember our no fee promise. If we do not recover anything for you, you do not owe us an attorney fee.